Traceability Matrix is a complex system which overwhelms a lot of people, but if you understand the base it is quite clear to follow. That’s why we tried to answer the question what traceability matrix is as easy as possible. Lets begin with saying it is a document that helps you to correlate and trace requirements in business to their implementation or completion. These requirements might be business related, the use of IT applications, security or a whole host of other points that need to be tracked. The idea of the matrix is to evaluate and relate different systems and provide a status of the project in terms of their level of completion. So, two sets of values are being compared against each other in a table. One value runs along the top row and the other down the left-hand column. The grid then serves to compare and relate the features of these two values as a means of calculating progress. For instance, in the case of testing of a product, value one across the top row might be the requirements and in the left column, the test cases complete. Where the columns and rows of these intersect there is a cross marked if the requirement is met in that test case. This then gives an overview of how well requirements are being met in testing. A traceability matrix is simpler than this sounds. Draw a table on a piece of paper. Across the top write the meals you would like to eat. Down the left column write the ingredients you can buy from the shop. Where the ingredient appears in the meal place a cross in the grid. Now, look at the grid and see which ingredients it is most cost-effective for you to buy in bulk, as you will always be using them. Look again at the grid and note that some meals have a lot of crosses, these may be too complex and too expensive to realistically have as part of your menu. One meal includes crosses that do not appear anywhere else, therefore would be inconvenient to make. This in simple terms is what a traceability matrix helps you achieve. There are three types of traceability matrix. Forward traceability, which is used to check if the project progresses in the right direction for the right product. It helps uncover if the requirements are applied to the product. Second is backward or reverse traceability that helps to assess whether the product is on track. This helps to keep the project from suffering from scope drift. Finally, bi-directional traceability ensures that all requirements are covered by test cases and then helps you to analyse the impact of changes to requirements. A requirements traceability matrix (RTM) is a little more complex and involves tracking the business requirements against the functional requirements. This requires the mapping of technical needs of a project against the business requirements. Why Do You Need a Traceability Matrix? It is easiest to see why you should use a traceability matrix when developing a product. It helps to provide a visual representation of the association between user requirements and the products being developed and implemented. It helps you to see you are building the product right with a representation of testing. However, with the changing needs of stakeholders, it will help to track that you are always building the right product. You also need traceability matrix in business, as you need it to determine whether you are delivering to business requirements or not. Though this is not so well documented when you look for how-to documents, matrices are much more useful to project and product managers that just merely seeing if the product tests well. One of the major benefits of using a traceability matrix is helping to triage for defects or problems that have gone unresolved as the project has progressed. You may have moved the project forward despite deficiencies in certain areas and the matrix will help you track back and work out what needs attention. The grid will help you focus on what needs doing but also quickly see the most important defects that need attention and put these into a priority of action. It is most commonly used when managing test cases. You can track your product requirements against the tests. Traceability matrix also helps you to track test coverage and reduce manual checking needed. Another use is managing versions of your product in the sprint to get the product to market. This can create a history of the development of the product or service that can help with reflection, as you can see how the requirements have evolved. If the stakeholder changes the scope, then this can give a clear history of these changes. It is also an accountability tool, helping you track if your team is on track. Finally, the essential reason for traceability matrix is to add to the documentation needed by all project managers. It allows you to show how you are delivering the product to requirements. It can also help you trace if you have all the documentation you need along the way too, with team members marking in the matrix when something is complete and even attaching this to certain packages. In short, a decent traceability matrix can help a team track a requirement from conception through to delivery and beyond if you are a product manager. It can assist in the planning and managing of testing and then later in triaging defects. It is a means of adequately document your project and ensuring accountability of the team to the requirements of the project. In other words, it is simple and it is essential. How Do You Create a Traceability Matrix? It sounds complex producing a traceability matrix when you hear co-relates and two-baseline and many to many relationship checks. It makes you want to search out a software product that asks you to go through a wizard and then automatically produces you the perfect matrix. But, as with everything the technique uses complex terminology when in fact it is quite simple to do. Let’s take the most common use of a traceability matrix, which is to track testing. The tester will draw out a grid with the requirements across the top row. This can be done in a spreadsheet easily enough, though there are templates on offer online. The tester will then give ID codes for each test done. If the requirement is met then a cross is inserted in the grid. If not, it is left blank. But there are other relationships that you will want to trace. You could want to represent the relationship between artefacts such as business requirements versus functional requirements; features versus requirements; etc. Open a spreadsheet and create a matrix. If you are tracing features against requirements then you might place requirement codes e.g. RE1, RE2 along the top of the matrix. Then down the y-axis you would put feature codes e.g. FT1, FT2. Where there is a relationship between requirements and features you place a check in the grid. If there is no check then you may wish to shade this in red. If there are suspicious connections you could further show this with yellow shading or use of a symbol. This spreadsheet then gives you a visualisation of the relationship between the two elements. In terms of features and requirements, it will show up coverage in the development of the product. If it was representing requirements against tests it might show up defects. For some, the use of traceability matrix will feel old school. Agile project management, for instance, may see this as unwieldy paperwork that is not needed. However, as well as being simple, to answer the question what a traceability matrix is. We can say it is highly effective at tracking a project and showing up what has been done and what still needs to be done. It is essentially all about transparency. The most common usage for a traceability matrix is in software development when the testers are checking to see that the platform meets the requirements laid out by the customer/ executive/ product owner. 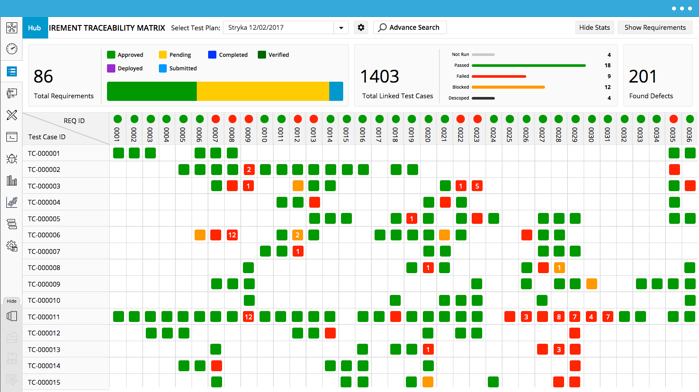 Most how-to guides will talk you through a grid that revolves around the testing phases. However, this is not the only application of a traceability matrix. It is useful in most areas of project management. It is a means of making sure you are delivering to the scope and preventing the scope from drifting. It is a way of creating version tracking, where the requirements from the customer/ executive/ product owner are seen as they progress. It can be used to make sure nothing has been missed. There are software packages that can help you produce traceability matrices, such as Accompa. However, realistically you only need a spreadsheet, using the shading of squares to identify areas of concern or where development is complete. It is not going to miraculously turn a project around or provide some revelation about what should happen next. However, a traceability matrix will mean you can see that all parts of the project are complete and there are no areas that have gone unchecked. In short, it is a simple accountability tool that means your product or project is managed to excellence. Read our Review of Priority Matrix here.